1. Fave bday party as a child? My mom had this book that had tons of different birthday themes...you know way before Pinterest...so it was always my favourite to pick out what kind of bday party I would have. My most memorable was a backwards party. Might also have been because I could invite boys. Turns out I was too lazy to really look for the picture of us eating cake on the floor under the table during the backwards party...so here's a dress up birthday party instead. I'm the one on the right. My BFF, Christy is the one on the left. Also- love the carpet up the wall. 2. Do you like to entertain? Ha. Do you know me? I love having my house filled with my people. 3. What kind of parties are your favourite? My favourite event that I host is Friendsgiving. This year will be the last time in this house and I'm trying to come up with a newfangled way to do it. I'm SUPER excited for Friendsgiving in the new house! 4. Big or small parties? We rarely do big parties...it's so hard to talk to everyone when the house is packed. 5. Favourite thing to do at parties. If I'm not hosting I turn into a major introvert and forget how to socialize, so I prefer to people watch. If I'm hosting I keep busy making people comfortable and happy. Man, that sounded like something my Grandma would do. Any appetizers. All the appetizers. 7. Favourite Flavour of birthday cake? How do you pick favourites when it comes to cake. Today is actually my son's 11th birthday and our house is filled with our people- we will be having 4 cakes. No. Too much work and I hate how they kinda hang out and linger around the house way after the party is done. Depends on the season. Right now it's Summer Oldies...but come fall it's always jazz. Not in public. I leave the dancing to the flossers. 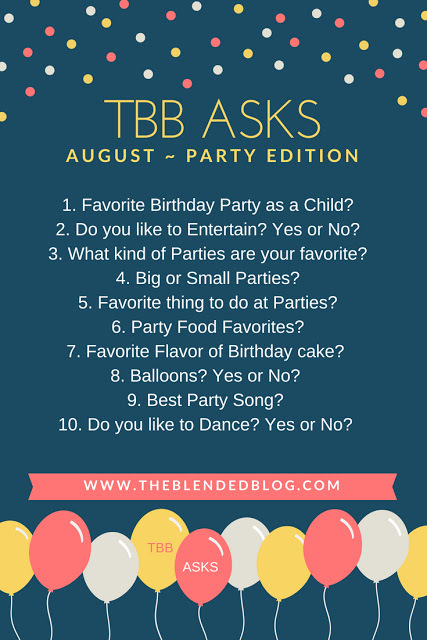 Linking up with the ladies on TBB for our fun link up ! All the apps baby!! LOVE the throwback! You always have the best parties! I so want to be at them every time I see/read about them. You are the best hostess! I am the same way if I'm at a big party I become an introvert and people watch, I'm most comfortable hosting because then I'm busy, busy, busy! 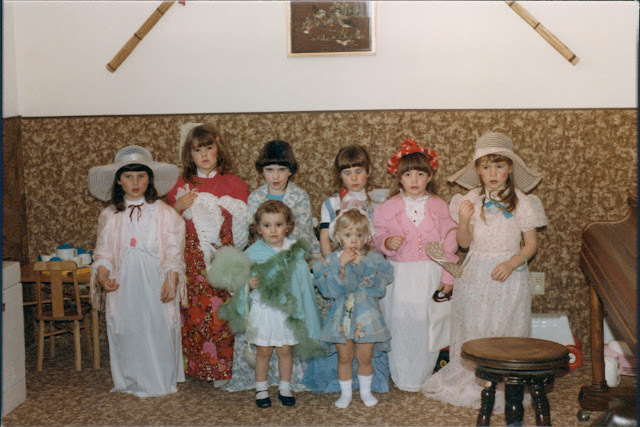 I love that your mom had a book of party themes - heck she should get credit for being a Pinterest pioneer! How cool! I remember your pool cake. I always loved that one. Also the money cake. Your mom was great at parties! Haha. We have the lingering balloons in the house!